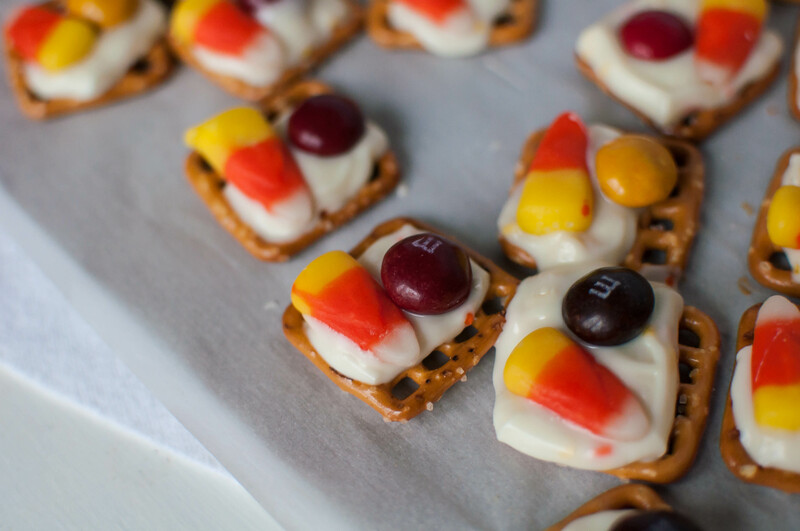 Pretzel Peanut Butter Candy Corn Bites. That title is quite a mouthful, huh? Well, so are these little treats. Salty pretzels are combined with a myriad of sweet candy to make the ultimate, festive Halloween treat. Sweet and salty FTW every single time. I got my inspiration from one of our favorite Christmas treats, Pretzel M&M rings but I didn’t just want to switch out the color of the M&M’s and be done with them. So when I saw these Hershey’s Candy Corn Crème Bars I thought they sounded way more delicious than a traditional chocolate kiss and as much as I love the combination of chocolate and peanut butter, I also love white chocolate with peanut butter and thought it would be a nice change. These little bars can be broken in half or into 4 pieces and I wasn’t sure which option for the pretzels would be better so I experimented with each option. I ended up liking them better with just a quarter of the bar rather than half. The pretzels with more chocolate were a little too sweet and killed the salty factor. No bueno. These are the perfect sweet pick me up to snack on this month or to use up that extra Halloween candy after trick-or-treating. Preheat oven to 275 degrees F. Line two baking sheets with parchment paper. Lay out a layer of pretzels on each baking sheet. Open all the candy corn Hershey's bars and break them apart along the perforated lines, 4 pieces per bar. Place a piece of Hershey's bar on each pretzel and place in the oven. Bake for 2 minutes. Remove from oven and press a candy corn and M&M into each. Slide parchment paper off the baking sheet (leaving the pretzel on it) and allow to cool and harden. I have had so much fun creating festive Fall and Halloween treats this year so if you like these, be sure to check out some other favorites. *This is not a sponsored post, I just really like candy.